When people think of spring cleaning and home rejuvenation, often the garage and garage doors are overlooked. Most homeowners today have a garage door that they use to come and go more often than the traditional entry door, just because of the convenience. However, it is possible to have both an aesthetically pleasing and functional garage door. With options ranging from numerous colors and finishes, window/glass options, insulation types, and more, you can be sure to find an option that fits not only your home but also your budget and lifestyle. Manufactuers offer a variety of insulation materials in their garage doors that range from non-insulated to having an R-value of 20.4, which is the best in the industry. If pets sleep in the garage or if you house a refrigerator/freezer in your garage space, it is important to keep the area climate controlled. If your home has living space above the garage, it is imperative to have an insulated door; otherwise, it will be tough to maintain a consistent temperature in your home. Not only is it essential for efficiency, but the insulation also makes the door more impact-resistant, meaning it is much harder to dent. Shelving and stockpiling in the garage are a necessity that most people overlook. Power tools, lawn and garden equipment, and other household items need to be in a safe location away from vehicles, pets, and children. No matter your reasons for garage organization, the fact remains that having a clean garage just feels good. Call it a sense of security, or maybe even a feeling of calm. Home begins at your garage. USI can help you create a customized shelving and storage solution no matter the space, and our professional and courteous installers will ensure the job gets done correctly the first time. 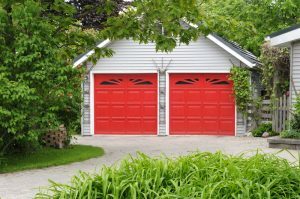 Re-imagining your home’s garage door can be fun project that offers the opportunity to show your home’s true colors. If you’re still trying to figure out just how to turn your garage door into something more than an access point for your home, don’t hesitate to visit us online and find a branch near you. USI believes that excellence in every step of the process and ensures timely completion and quality of service, time after time. Can I add insulation to my garage?